When is the right time to start giving your child an allowance and how are you going to teach him the best way to save or spend the money he or she receives? If you are used to worrying about your own budgetary restraints, you might have to put your own financial affairs in order first before you can consider showing your child how to manage an allowance. After all, we have to make sure we are teaching our kids how to use money in the right way. Many times, unbeknownst to us, our children are greatly influenced by what we do and say. They seem to always be watching when we least expect it. And, one thing they watch more than anything is how we spend our money and how we pay for things. Therefore, financial responsibility is not one of those subjects that parents can take lightly in life whether they are a parent or a kid. Children are not learning budgetary practices in the classroom, and I do not think that we would want our public school teachers teaching money matters to our children. So, it is up to parents to take the upper hand and provide the tools necessary in order for their children to succeed in the financial arena. By showing our children a good example with respect to fiscal responsibility, we can ensure that they will develop good decision making skills with regards to their own financial future. It starts with developing a sound savings and spending plan for ourselves. That way, we can instill the right type of impression to our children. Your Household Budgeting. Our ability to teach our children starts with building our own monthly budgets. You must get back to the blocking and tackling of personal finance. You should have a written monthly budget for yourself that reflects where every dollar of your money goes every month. Then, you can decide on what time is best for your child to start receiving an allowance. Much, of course, will depend on your child’s maturity level and his ability to comprehend the importance of saving money and spending it appropriately. Typically, you can start implementing some type of allowance when your child is around ten years old. Start With The Basics. Make certain your child is well-versed in math or adding, subtracting, multiplying and dividing before you give him the responsibility of receiving any amount of money. Make him or her aware of the cost of some of the products or items you buy, such as toys, soft drinks, and snack items that directly relate to him or her. Be sure your child understands what it takes to purchase small luxuries or necessities. 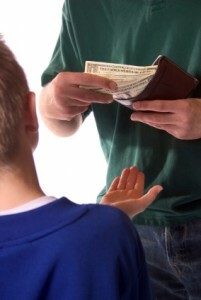 Is your child disciplined with money? It might be good to sit down with your child and review the types of expenses you want him or her to cover with the allowance. These funds might go to basic needs as well as items used for more leisurely pursuits such as video games and movies. Do you expect your child to save any of the allowance? Do you want them to practice saving a certain amount or percentage of the allowance money you give him or her? Whether you choose to reward your child with an allowance for the chores he or she completes or by performance in school, your choices and ways to attack the situation are varied. What is important is that your children learn the importance of spending, saving, investing, and giving. Money can be a tool and should be taught to our children as soon as possible both directly and indirectly through our actions. Remember, no matter what, they are always watching! Our two little boys get money now and then, but they don’t get to spend it. They are too young to understand such an abstract concept as “fiat money” which is why they put all their money into a piggy bank. They do know that these coins are “money” – whatever that means. We think it is good for them to get the connection between money and saving at an early age. They’ll learn soon enough that money can be spent very easily.